The Titan unmanned ground vehicle (UGV) is an ideal platform for small dismounted military operations. Photo: Business Wire. The Titan UGV has a curb weight of 2,000lb. Photo: Business Wire. Titan is based on the Tracked Hybrid Modular Infantry System (THeMIS). Photo: Business Wire. 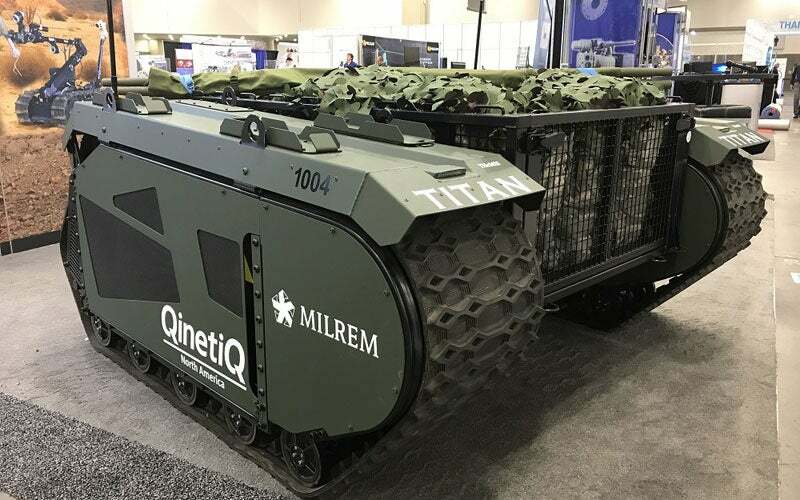 Titan is a fully modular, hybrid unmanned ground vehicle (UGV) developed jointly by Milrem and QinetiQ North America (QNA). It is based on Milrem’s THeMIS (Tracked Hybrid Modular Infantry System). 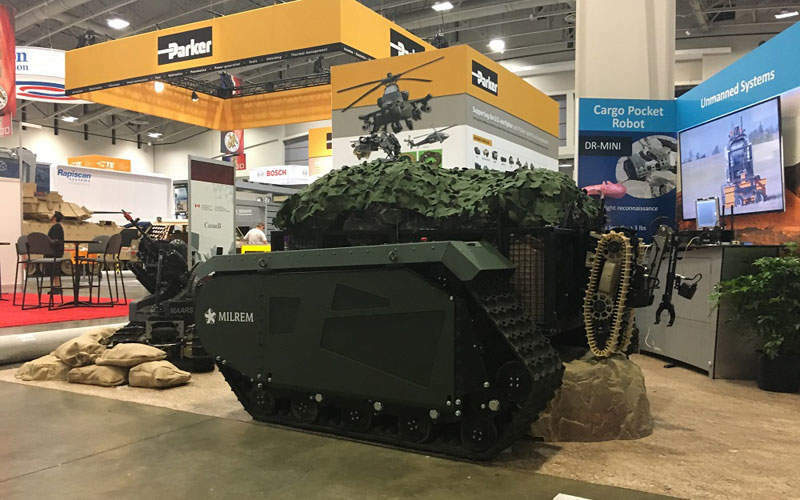 The UGV was unveiled at the 2016 Association of the United States Army (AUSA) Annual Meeting. It was also displayed at the ninth annual Ground Vehicle Systems Engineering and Technology Symposium (GVSETS) held in August. The Titan UGV was preferred by the US Army for Phase 1 evaluation of the Squad Manoeuvre Equipment Transport (SMET) programme. The vehicle is intended to save the lives of soldiers as it performs critical and hazardous tasks currently handled by war fighters in the combat zone. Titan is a multi-mission UGV that can be reconfigured to enhance mission effectiveness. 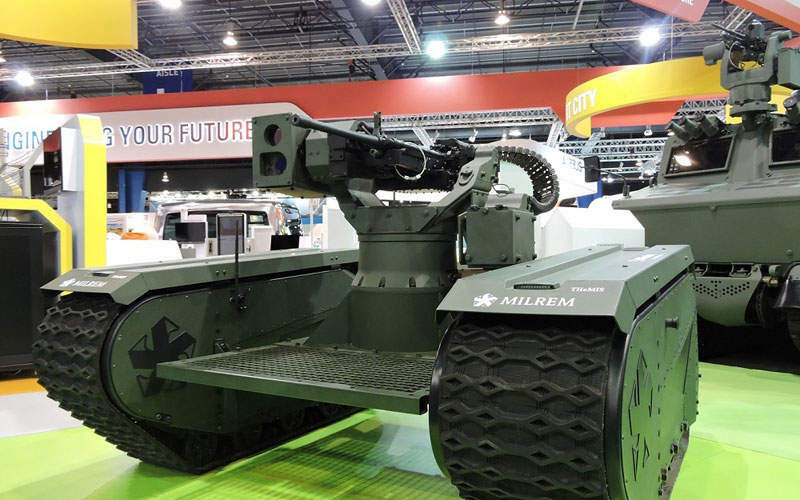 It integrates the battlefield-tested robotic systems and controller from QNA and THeMIS UGV platform and modular mission payload developed by Milrem. The platform includes two track modules connected by a payload frame. The open architecture of the Titan UGV allows for the integration of mission equipment and systems to support a range of operations. The UGV measures 79in-long, 83in-wide and 40in-high. It offers a payload bay area of 72in x 48in and has a curb weight of 2,000lb. The Titan UGV is capable of carrying a maximum payload of up to 1,500lb. The higher load carrying capacity provides force multiplication for the users. The vehicle offers a maximum pull force of 2,000lb. The typical payload aboard the vehicle includes an earth-moving blade / bucket, casualty evacuation (CASEVAC) litter racks, logistics support basket and ruck mounts, anti-personnel obstacle breaching system (APOBS) mounts, counter-improvised explosive device (C-IED) roller rake mount, and C-IED sensing systems. The vehicle can also be interfaced with third party payloads such as remote weapon station (RWS), interrogation arms, reconnaissance, surveillance, and target acquisition (RSTA) systems to support combat, chemical, biological, radiological and nuclear (CBRN) defence, RSTA and route clearance missions. The flexibility to install multiple payload systems increases efficiency and reduces lifecycle costs and soldier workload. The unmanned ground vehicle can be operated in both unmanned and manned modes based on the mission. It can be integrated with cameras, and day / night infrared (IR) and thermal imaging systems to perform missions during the day and night. "The vehicle is intended to save the lives of soldiers as it performs critical and hazardous tasks currently handled by war fighters in the combat zone." The command and control of the UGV is handled using the QinetiQ tactical robot controller (TRC) and robotic appliqué kit (RAK). The TRC is a single pocket system integrating a 6.5in monitor, button layout and auxiliary port. It can be easily attached to the communications pack of Titan to command and control the UGV’s operations. The RAK provides multiple optional autonomous features and allows the integration of night vision and thermal cameras, microphone and radio systems. The multiple crew-compliant radio options enable a line-of-sight (LOS) range of more than 800m. The vehicle is propelled by a pair of diesel-electric hybrid tracked drive modules powered by a 10kW JP8 generator and absorbent glass mat (AGM) lead acid or lithium-ion batteries. It also offers sufficient power to charge additional devices. The all-electric run-silent mode provides a maximum range of more than 20km and endurance of two hours, while the diesel / electric hybrid operation ensures a maximum range of 100km and endurance of 72 hours. The power-pack provides a maximum speed of approximately 24km/h. The vehicle offers superior off-road mobility. It can cross trenches with a maximum width of 30in. The UGV can be transported by helicopters internally or as slung load.